Adam and Dave Nolan have amassed an impressive collection of Colonial era artifacts in only a short period of time. The quest for relics has taken us to many distant and interesting places, and we've logged many a mile on various vehicles in the pursuit of history. The roads on which we traveled were not always the smooth asphalt of a super highway, but usually the potholed secondaries and dusty backroads. It's a statement which can be taken both literally and figuratively, for the research and act of obtaining permission were often fraught with potholes and detours as well. How often has research revealed a potential site, and when the bookwork turns to legwork, we find that a housing development or a mall, a grand hotel or expansive marina, sits exactly on the site we so desired to search? It has happened more times than I care to reflect on. How often has similar research unraveled a suspected tract of land, and, on scouting the site, you find that it is free of buildings-but the owner's response has been less than accepting? How often have you walked down your driveway, crossed a narrow road, climbed a small hill, and found yourself on the site of a Revolutionary War encampment? Probably, your answer to this last question is a resounding Never! However, the story I'm about to tell is one that supports one of my firmest beliefs... the belief that during the course of our often mundane lives, there lurks the ever-present element of surprise, and the fact that magic can often be found just around the next corner! 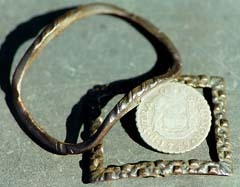 Ornate brass shoe buckles and Spanish silver coins were among the interesting finds made at the Colonial encampment site. It was a little over a year ago when our group traveled north to attend the Best of the Northeast III show in Keene, New Hampshire. Along with the displays and seminars, the new equipment and accessories, one of my greatest thrills is meeting the people who form the backbone of our hobby... the people who hit the fields and do the digging. The conversations are always interesting, and the recoveries they bring with them are often enough to rivet the attention of even the most jaded detectorist! It was at the Bone III show that we first met the brothers Nolan, Adam and Dave. All of the guys in our relic hunting group were impressed with their affable nature and enthusiasm for the sport, and though the finds they were making at the time reflected the fact that they had only been swinging a detector for a short period of time, somehow you knew that their perseverance would one day pay off. At BONE IV, their display and recoveries were enough to win several awards! Taking a break from our booth, I took a walk through the display area to check out some of the finds fellow relic hunters were making. I hadn't walked very far when my attention became suddenly gripped on a display case full of Colonial-era shoe buckles. As I walked closer to the display and the focus of my attention widened. I could see that the assortment of shoe buckles was only the very tip of the relic iceberg! Situated around the buckles was an assortment of American and British Revolutionary War buttons. Beside them were Colonial eating utensils and clasp knives. One corner of the case consisted of an array of British coppers and Spanish silver. The closer I looked, the more I saw. To say the very least, the collection was impressive! Standing before the cases of relics and display of field photographs were Adam and Dave. "We had a good year of relic hunting," stated Adam. Two-tined forks, pounds of iron cooking pot fragments, and the remains of several iron knives reflected the more domestic side of this military encampment. "A very good year!" Dave was quick to add. "Would you like us to open the cases so you can examine some of the relics more closely?" More than one line drifted across my mind, but I figured a hearty "YES!" would suffice, and for the next half hour I pored over individual relics, some of which I only knew from photographs in books. Before the end of the show, Adam and Dave had invited us down to their area for a day of relic hunting on some of their sites, and an opportunity to view some of the collection they had not brought with them. It was, to say the least, a generous invitation! When Roger, Gene, and I arrived at the Nolans' house, we first viewed their collection of artifacts, which covered the top of a pool table. Dave was correct when he had said they had a very good year. Along with a number of relics we had seen at the show, we saw some others which had not made the trip. I remarked on the number of iron cooking pot fragments, and Dave told me to wait a minute while he retrieved something from another room. He returned minutes later with a box filled with about 20 lbs. of additional cooking pot fragments, all of which had come from the same site. It was easy to see, after viewing the collection, that we were eager to crank up our detectors and hit the fields. We asked how far away the site was, and were astounded with the answer we received. "You can leave the truck right here in the driveway." said Adam. "It's just a short walk on the other side of the road." I couldn't believe my ears! "What are you saying... you just roll out of bed and find yourself on a Colonial site?" I asked. "That's just about it," one of the Nolans replied. The wide variety of relics from the site indicated it had seen human activity over a long span of time. Buckles and ice creepers, numerous buttons, and broken pipe stems were among the recoveries. Hefting our equipment, we began the short walk to the site, during which I learned how they had stumbled upon the location. As Dave related it to me, he and Adam had been searching a nearby park for coins when they began turning up some older objects. The area where the Colonial artifacts were found was near the edge of the park, and looking over the adjacent road, they noticed a wooded hill beyond. "We decided it might not be a bad idea to try the woods, and when we began swinging our detectors on the lower slopes, we once again picked up the trail of relics," Dave related. "The trail led us to the top of the hill where most of the recoveries were made." Our small group made for the top of the hill. Having once attained the summit, it was easy to see that it was a site well chosen and easily defended. The steep grade on most sides would have made it difficult to attack, and the numerous rock outcroppings offered a refuge from both wind and weapons. Within minutes, the entire team was sweeping the ground with their coils, in the hope of finding additional evidence of the Colonial encampment. The first new factors we noticed was the heavy mineralization in the ground, and that certain areas of the site were strewn with hand-forged nails. It was a site which demanded our listening around and through certain signals without being forced to back off on some of our regular detector settings. 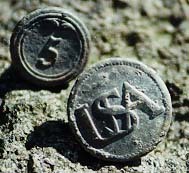 From the forest floor came American pewter buttons of the Revolutionary War era. The rocky ground, untouched by the plow, kept such delicate items in a remarkable state of preservation. Each of us found more than our share of shotgun shell casings during the initial portion of the hunt, but later we were able to turn up some interesting older pieces dating from the 1700s. Cooking pot fragments continued to be found, and the lower section I recovered still had one of the legs attached to it. The site presented a few unique questions which I had never before encountered. On typical encampment sites, there are always a large number of dropped musketballs recovered, along with smaller caliber pieces of buckshot. In this case, including the dropped balls found on previous hunts by the Nolan brothers, the cooking pot fragments outnumbered the total of musketballs recovered. Was the site just a feeding station for Colonial troops, where they would form a "Chow line" before heading off to a nearby, and yet undiscovered, location? If this was the case, why situate it on the top of a high and rugged hill? It always seems to come back to the same fact that the more we strive to uncover, both in relics and information, the more questions with which we seemed to be plagued. 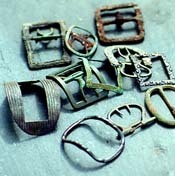 The buckles found by the Nolan brothers cause one to speculate about the number of style variations such common articles took. There must have been a buckle for everyone's taste or pocketbook! Somewhere in the surrounding wooded hills, I think the Nolan brothers will find the answers to some of these questions. They live in an area drenched in history, and no doubt their home sits on land which once knew the marching cadence of American and British troops. It's only a matter of time before the ground gives us its secrets, and I know that Adam and Dave will be there when the pages of the full story are finally turned!